Today, Apple released a document to help iPhone and iPod Touch owners who are having Wi-Fi issues. Below are the Symptoms and some Fixes. You can see the original document on Apple’s website HERE. • iPhone or iPod touch appear to be connected to a Wi-Fi network but cannot use Wi-Fi for checking email, surfing the Internet, or other data transactions. • On the device, when you tap Settings > Wi-Fi and then tap next to the network, no values or entries for IP Address, Subnet Mask, Router, or DNS appear. • The device shows no Wi-Fi address (Tap Settings > General > About and scroll down to Wi-Fi Address). This can happen if, during the initial setup of the iPhone or iPod touch, no Wi-Fi address was registered. So while the device can attach to different Wi-Fi networks, it will not be able to retrieve an IP address because the Wi-Fi router doesn’t see a Wi-Fi address from the device. 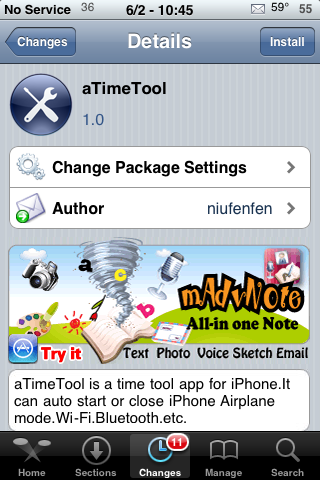 aTimeTool is an application that allows you to set a timers that allow the ability to turn on/off your iPhone or iPod Touch’s Airplane mode, Bluetooth and WiFi. It is a pretty simple application. Once installed you have four options; Airplane Mod, Bluetooth, Wi-Fi and Settings. Collaborative Whiteboard is a pretty cool drawing application. This app was actually released a few days ago but, I was planning and hosting a little boys 2nd Birthday party (an Elmo theme I might add) so, I’m just getting to review it now. I have tested this application a few times now and honestly, I like the concept. Collaborative Whiteboard is an application that allows 2 iPhones or iPod Touches to draw simultaneously on the same image. This is done via the same WiFi connection. Free WiFi at AT&T Hotspots Including Starbucks! 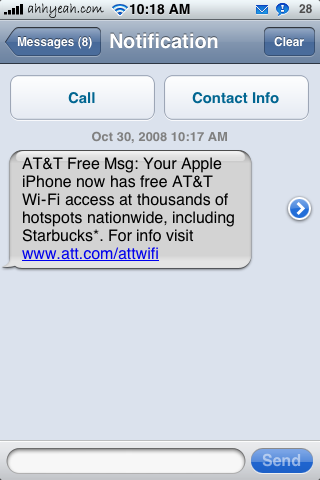 Rumor has it that people have been getting text messages from AT&T saying that their iPhone has free WiFi access at AT&T hotspots…including Starbucks. Well, this morning both Doug and I received that exact text message. If you click on the link in the text message you get a webpage with more info (see screenshots below). At the bottom of the webpage there is another link titled, “Get started with AT&T WiFi.” When selected, it gives you exact instructions on how to connect to the WiFi. So, we decided to check it out. 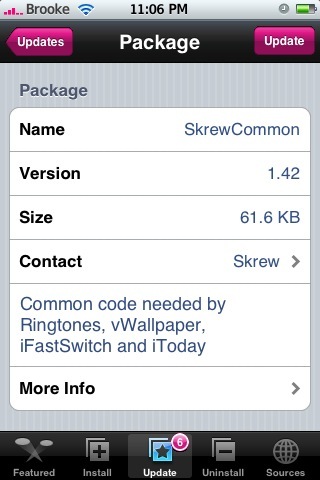 I did a post with a preview of SBSettings a about a week ago and it seems that it is now available via Cydia. SBSettings is said to be a full replacement to BossPrefs (which we all love so much)! When you install SBSettings, you will not see an icon on your SpringBoard. You activate the application by swiping on your Status Bar (that is the bar at the top of your iPhone or iPod Touch that have the time, carrier logo, battery…). This will bring up SBSettings. The upper part of the menu are features of SBSetting the lower part of the menu gives you information about your iPhone or iPod Touch. Such as the name of your iPhone, your WiFi IP address, your Data IP address and the amount of space available on your iPhone. 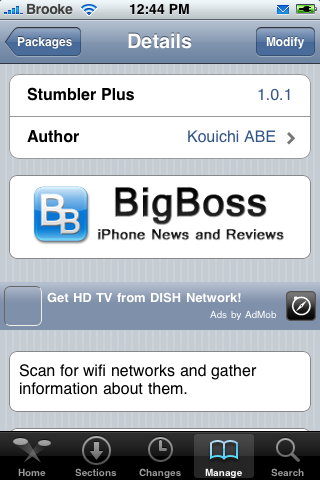 StumblerPlus is a WiFi network finder. When you open the application, you will get the main screen where you will notice a Scan option in the upper left corner. 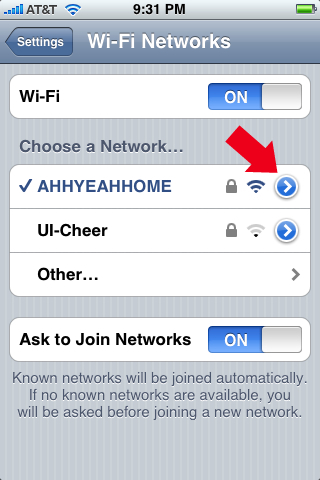 When you select Scan, you will get a list of WiFi networks in the area. You can then select a network and get more info about it. Here is what you will get; SSID, BSSID, OUI Vendor, RSSI, Singal Strength, Channel, AP Mode, Beacon Interval, WPA, WEP and Hidden Network. Do not ask me what any of that means!! Hopefully none of it is private! But, if you are into all knowing all that stuff…there you go. Check out the screenshots below!